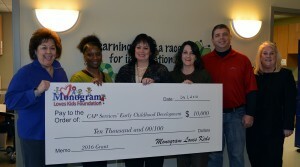 Monogram grant helps CAP Services’ Children’s Discovery Center add classroom – CAP Services Inc.
Pictured, from left, are Carla Kluz, CAP Services’ VP Early Childhood Development; Malinda Vance, Monogram; Kathy Sager, Monogram; April Niemi, CAP’s Assistant Director of Early Childhood Development, Jeremy Moe, Monogram; Sheri Woodward, Monogram. CAP Services’ Children’s Discovery Center in Stevens Point will add a classroom thanks in part to a $10,000 gift received last fall from the Monogram Loves Kids Foundation. CAP’s Children’s Discovery Center, located at 3109 John Joanis Drive in the Portage County Business Park, offers quality child care, on-site 4 Year-Old Kindergarten, Head Start/Early Head Start services, and educational services to children ages 6 weeks to 6 years. The center operates child care year round and offers full- and part-time enrollment slots. Enrollment is open to all families regardless of income. The classroom project will see the center to finish space added in a 2014 expansion by adding a bathroom and other necessary equipment to the classroom space. The project is estimated to be complete by April 1, 2017. The Monogram Loves Kids Foundation, the fundraising arm of Monogram Foods, awarded more than $240,000 in 2016 foundation grants, with individual grants ranging from $1,000 to $10,000. Since 2010, Monogram Foods has donated over half a million dollars to various children’s charities in Memphis, Tenn., Martinsville, Va., Chandler, Minn., Bristol, Ind., Schulenburg, Texas, Harlan, Iowa, Plover, WI., and Wilmington, MA.